Before we start I'd like to say this, i have algae in my tanks. I do not consider myself an authority on the matter but i want to share whatever knowledge I've acquired when it comes to algae and how to fight it. Some of the techniques mentioned here have worked for me, but if someone have a different way, by all means use it if it works for you. I don't believe in 100% algae free tanks, they thrive on just the same things as plants, so by promoting plant growth, you are inherently promoting algae growth. But that does not mean we are powerless, while 100% free is impossible, keeping it under control is quite possible, if you know how. Algae are simple plants that range from microscopic (Microalgae), to sea weeds (macro algae). They can be grown in almost any type of water, from brackish to seawater or from freshwater to waste water. Basically if there is water, there is bound to be algae. Most algae grow by photosynthesis using sunlight, co2 and nutrients in what is called autotrophic growth. Other ones grow in the dark by using sugar and starch as a source of energy (heterotrophic growth), and some of them mix the two to be able to grow (mixotrophic growth). They can be found almost everywhere, they help purify water, are an important part of the aquatic food chains and most of all they provide 70% of the oxygen on the planet. Despite the fact that without algae most of us would find breathing a bit difficult, fact is amongst the planted tank community algae is public enemy number one. While natural in nature, when it comes to planted tanks algae can be a nuisance even for the most experienced of us. 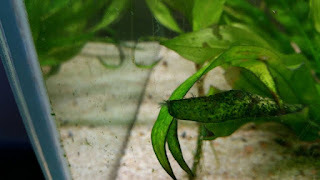 However in nature there is a balance were algae and plants are part of a natural ecosystem, in our aquariums that is not so easy to achieve and the hobbyist normally faces a hard time trying to keep it. When I say trying to keep the balance is because literally, that's what it is. Some algae is actually sign of a healthy planted tank, the problem is that when it's too much it makes your tank ugly to look at, and ultimately can damage your plants. Despite being single celled organisms, algae have the ability to photosynthesize just like all plants do. And in there lies the problem, plants thrive on a fine balance between light, co2 and nutrients. All of these are also required for algae to grow, so by giving our plants conditions to grow, we are also promoting the growth of algae. The problem is as multi-celled complex organisms, plants need a balanced supply of these three to grow, while the simpler single cell algae do not, they can thrive on whatever they can find. So if your tank is unbalanced, your plants will struggle but your algae will love it. Years ago it was thought that algae was mainly caused by too much light, today we know better. Most of the algae problems are co2 related. They are caused due to not enough, or inefficient supply. Thus we should avoid variances in co2, by keeping a constant and steady supply. To do that a good flow around the tank is needed, this will make sure that co2 and nutrients get where they are most needed, the plants. So a lack of good flow can also be the reason for algae , because it will cause an inefficient distribution of co2 and nutrients. Light in itself is not the cause for algae, but too much will make it harder to keep the balance, you'll need more co2 and nutrients to keep your plants healthy, failure to supply these ones in enough quantities will most surely lead and unbalance that may cause algae. Nutrients were also to be believed to be a cause of algae, it was thought that too much nutrients where the cause of algae blooms, the estimative index by Tom Barr kind of blew that theory out of the water. Dosing in excess, making sure your plants have a steady supply of nutrients, makes sure that they never run out and not only prevents algae, it promotes healthy plant growth. If anything is the lack of any given nutrient that can trigger an algae bloom. Excess nutrients only becomes a problem if the tank is unbalanced with algae already present. But in the end most of the times it all comes down to CO2. Bad tank maintenance is another reason for algae, dirty substrate, too much organic matter in the water, or a dirty filter are known to cause ammonia spikes which in turn bring about those dreaded algae blooms. Another more less known cause for algae is the presence of too much silicates in the water, this one often explains our brown algae blooms, this can also happen in thanks that use sand as substrate. However there is a wide debate amongst hobbyists if this is actually the case. So to keep algae at bay you need to keep your tank balanced, but when you get them there's always some ways of trying to get things under control. As a first step, cutting down your light is a good idea, this way you are slowing down things in the tank, including plant and algae growth. It wont get rid of it but will slow its spread and give you time to do something to fix it. You can do this by either dimming your lights if you have a fixture with this feature, switching of light bulbs, cutting the light hours or lifting the unit higher above the tank. If neither of the above is an option, adding some floating plants will help shade the tank. This is called using light as the limiting factor. Step two is to increase co2, since most algae problems comes due to lack or inefficient supply, so most of the times just adding more is enough to stop algae growing. Please use a drop checker to avoid overdosing, and increase it slowly over a larger period of time. The goal here is to kill algae, not fish. While it is unlikely to have and excess when dosing EI while keeping up with your water changes, not dosing enough, or dosing an unbalanced amount can be just what your algae are waiting to thrive, remember algae take up anything your plants do not. 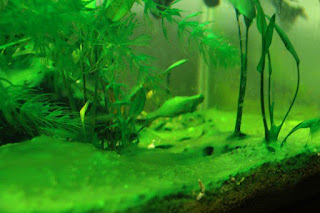 Overall i rather want to see healthy plants, even if there's some algae then unhealthy ones. So make sure you are dosing enough of all the nutrients required in sufficient amounts. Step Four is to increase flow around the tank, all that co2 and nutrients aren't going to change anything if they don't get where they are needed. 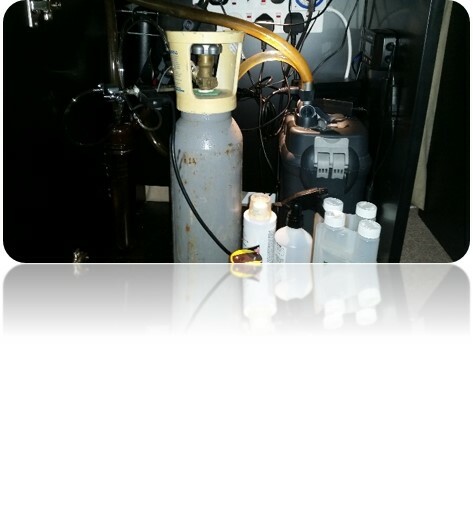 Adding a powerhead, increasing the output of your filter if possible will help do the trick. Sometimes just playing around with the placement of the pipes is enough to help. 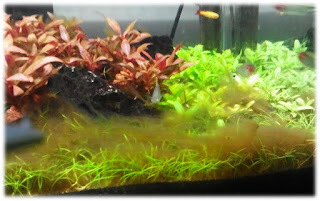 I have a blog post that looks into the Importance of flow in the planted aquarium in detail, feel free to check it out. Step five is to increase your water changes. Water changes helps get rid of any excess amount of nutrients and resets your tank. Make sure to give a good clean to the tank, a clean tank is a healthy one. Also make sure to remove damaged or dead leaves to prevent ammonia spikes. Step six is to manually remove as much algae as possible. This can be done by vacuuming it out or removing by hand. When it comes to hardscape and equipment brushing it out with a toothbrush normally does the job. Also remember to clean the glasses, for this use a glass scraper, an old credit card will do the same for free. Step seven treat the tank using seachem flourish excel or easy carbo, while these two are sold as liquid sources of co2, they are known to be effective at killing algae. You can dose the entire tank, or for more resistant patches do a spot treatment. Just remember to shut down all filters and powerheads before you do it. Step eight is similar to step seven, however instead of liquid carbon we use hydrogen peroxide (H2O2). I'd like to thank Dave from ADUaquascaping for his videos, specially the one where he taught me this little trick. Hydrogen peroxide is amazing at killing algae, and the best of it ,it's mostly harmless to your tank, once in the water it breaks down to its original constituents which is oxygen and water. Just do a spot treatment, but remember to shut everything off. It is important to add that some plants like carpets tend to get damaged if peroxide is used heavily, also do not use hydrogen peroxide in the presence of shrimps as if they graze on the treated area it will kill them. If you want to use peroxide I recommend spot treatments and remove any shrimps before use. Fish don't seem to be affected. Step nine is to clean the filter, most people do all the above and still get algae, they just can't understand why until they open their filter. There's only so much junk your filter can clean, absorb and keep it in itself, when enough is enough it will start leaching ammonia back into your tank. Ammonia that in turn will cause algae. Step ten is to increase plant mass. If you increase the amount of plants in the aquarium by adding fast growers you are increasing your plant mass, eventually they will outcompete and starve the algae of nutrients which in turn helps you balance your tank. If these plants are not part of your planned scape you can always take them out once the tank is stable. Step eleven is to add a cleaning crew. 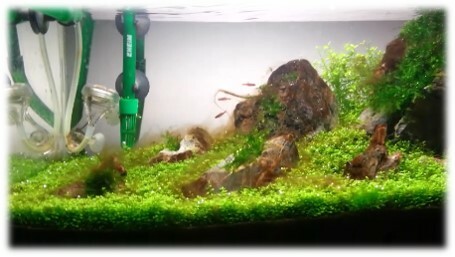 While i don't approve of basing your algae control solely on live stock, i do believe they can be put to good use when together with the above algae control techniques. They cannot clean a tank overrun with algae by themselves, but they help getting rid of those last patches, or at least to prevent a small patch of algae to become a big one. Algae eating shrimp and fish where made popular by takashi amano himself, so who i am to say it does not work. Just don't put your all your chips in it when it comes to keeping your tank free of algae. I have grown to believe that all planted aquariums should have a cleaning crew planned from the start, as they are useful at keeping the tank clean, which in turn helps prevent algae. I hope this can provide some help not only fighting your next algae bloom, but also as a preventative measure as most of these can be used to prevent algae. Future blog posts will go into more detail into specific types of algae.